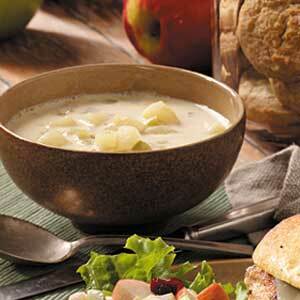 Creamy Potato Soup with Rivels…… just like Granny used to make! Warm up with a nice hot bowl of soup on a cold, blustery, winter day! This is pretty easy to make and you can make it “yours” by changing the meat you put in. I normally use diced ham. I have used little smokies, (those little cocktail sausages). I have also used crumbled, cooked bacon…. also good is a nice polish sausage or kielbasa, sliced. Start with a pot that will be large enough to hold the amount of soup you want to make. I normally make it for a group of at least 6-10 so, scale up or down your ingredients accordingly. Wash and peel about 8-10 large Idaho potatoes. cut into bite sized pieces. place into pot and cover with water. once boiling, add to water 1 pkg dry onion soup mix. continue to boil until potatoes are tender. not mushy, try not to overcook. While cooking potatoes, make rivels. Mix about 1 tsp salt with 2 cups of flour, put this flour into a bowl. Make a well in center and add 2 whole eggs. Now with a fork mix together eggs and flour by starting at the outer edge of the bowl and “turn” the flour into the eggs. The fork will proceed down through the eggs and by repeating this motion you will eventually mix all the flour with the eggs. You are not making a sticky dough. your mixture should look more like a dry crumbly mix, almost like pie crust, but much larger pieces. Make sure the eggs are thoroughly mixed. Once the potatoes are cooked, continue boiling, do not drain potatoes. Drop the rivels into the boiling water by gently adding the entire bowl and stirring the potatoes while you add rivels. Cook allowing to boil for about 5 min. remove from heat. Add 1/2 stick real butter, allow to melt and then stir. Add meat, what ever you want to use. Like I said I normally use diced ham. I like a generous amount of meat so I will use about 2 cups of diced ham. Add about a quart of whole or 2% milk, stirring to blend. Now either return to heat, on low or do as I do. Put it in a crock pot on warm or low. After about an hour, this soup will be blended and thicken up to a wonderful consistancy. If it gets too thick add more milk or water. Do not cook this on high heat or allow to boil after adding the milk. Milk will scortch and burn very easily. Thats why I use the crock pot once its cooked. I have also added some cubes of velveeta about 1/2 an hour before serving. Makes an awesome cheesy potato soup too. This entry was posted in soups and tagged busy mom, butter, comfort food, creamy, crock pot, easy meals, favorites, food, from scratch, granny recipes, homemade, meals, old fashioned, potato, rivels, soups, warm. Bookmark the permalink.